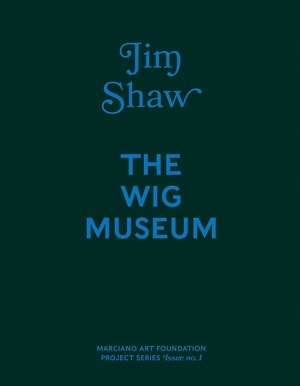 Book of the Day > Jim Shaw: The Wig Museum. Published by The Marciano Art Foundation. "The inaugural exhibition of the Marciano Art Foundation, Jim Shaw: The Wig Museum highlights Shaw’s (born 1952) career-long engagement with America’s diverse histories. The Los Angeles local used the enigmatic artifacts found during the transformation of the former Scottish Rite Masonic Temple where the foundation resides—stage sets, robes, costumes and wigs—to construct a metaphor for the wig-wearing masonic and judiciary Anglo-Saxon power that is coming to an end."